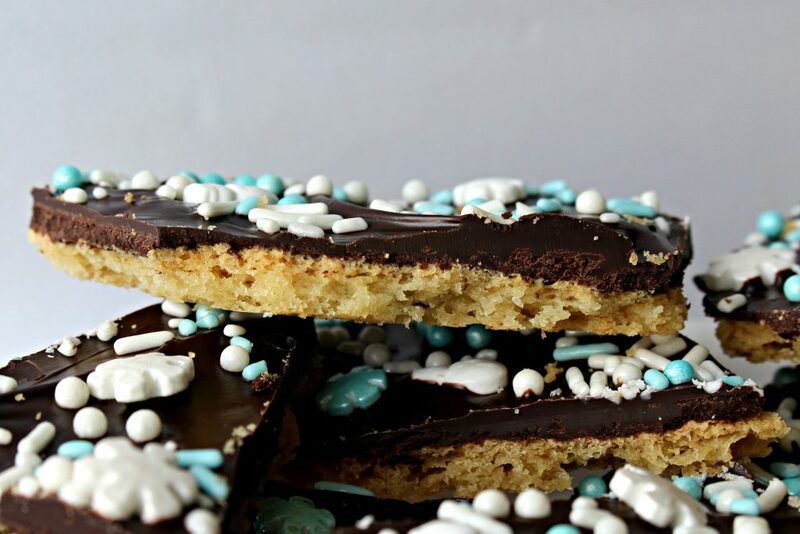 Sugar Cookie Chocolate Bark is part cookie, part candy, and one hundred percent scrumptious. A crisp sugar cookie crust is covered in white and dark chocolate and showered with sprinkles. 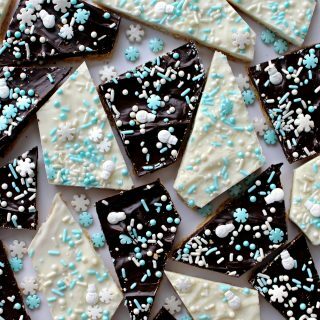 Sugar Cookie Chocolate Bark is pretty enough to serve to company or for gifts, but it only takes minutes to make, so you can share cookie bark any day of the week! 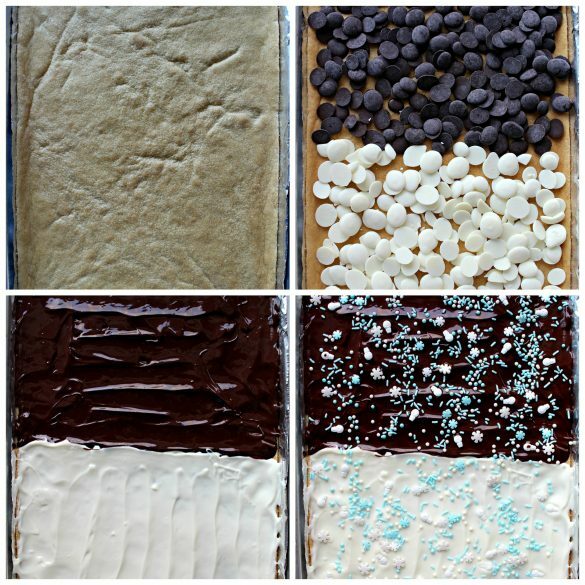 Time Saver Recipes for cookies and bars are especially helpful this time of year. December is extra busy with Christmas celebrations and gift giving. However, the ingredient shortcuts in Time Saver Recipes are great all year, whenever time for baking is limited. Sugar Cookie Chocolate Bark is a super simple Time Saver Recipe. Using store bought refrigerator cookie dough for the crust saves time. No measuring or mixing is involved. One roll (16.2 ounces) of dough, flattened to cover the bottom of a jelly roll pan, is baked until golden. Immediately after removing the cookie dough from the oven, chocolate pieces are sprinkled on top. 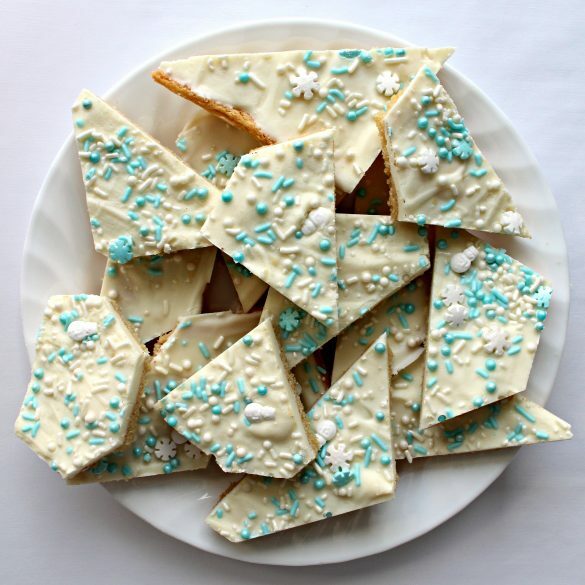 For variety, I used both white and dark chocolate on my Sugar Cookie Chocolate Bark. (I used dark and white candy and molding melting chocolate from Chocoley.com, for chocolate that tastes wonderful and firms with a lasting, shiny luster.) In just 10-15 minutes, the chocolate is melted and spreadable. Add sprinkles as the finishing touch. That’s it! This week, I gave two batches of Sugar Cookie Chocolate Bark to friends celebrating Christmas. One family will nibble on cookie bark as part of their holiday dinner dessert. Another friend is hosting a brunch for extended family. I hope that one less treat to prepare will help her have more time to enjoy the occasion. 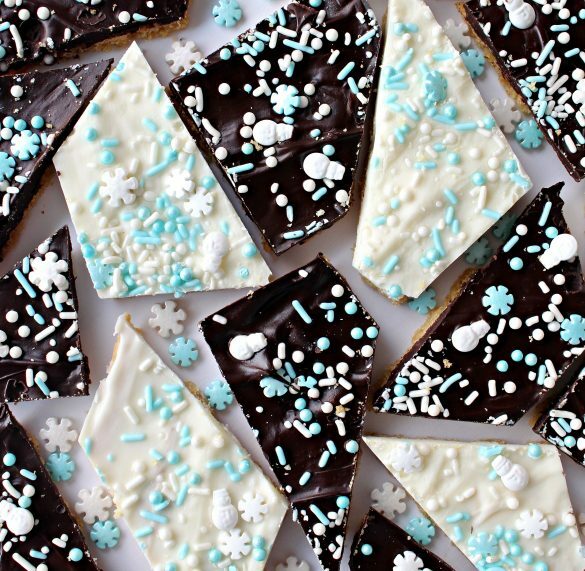 There are so many occasions to share Sugar Cookie Chocolate Bark. New Years is one week away. Chocolate and champagne, anyone? This treat is sturdy enough to include in lunch boxes and care packages. 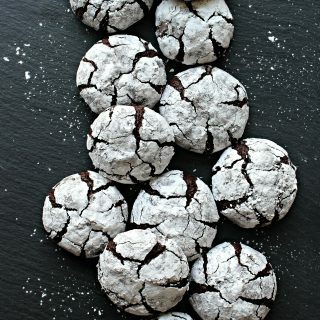 It looks so pretty on cookie platters for holidays and parties (birthdays, showers, graduations). A box or tin filled with Sugar Cookie Chocolate Bark makes a lovely hostess gift or teacher appreciation present. Just change the sprinkles to match your celebration. 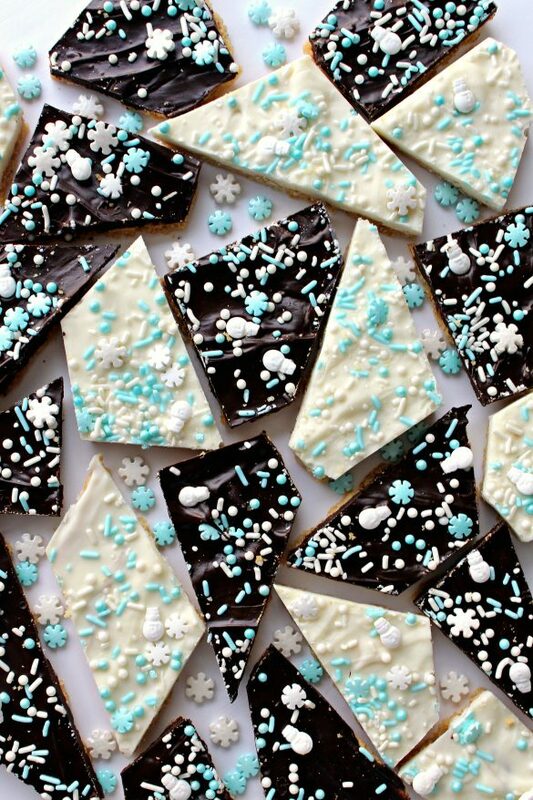 How will you share some Sugar Cookie Chocolate Bark? I hope those of you who celebrate Christmas have a joyful holiday! Wishing everyone a healthy, peace-filled New Year! Preheat oven to 350° F. Line a 10 ½ ” x 15 ½ ” jelly roll pan with parchment paper or foil. Scatter pieces of cookie dough into the prepared pan. Use a sheet of wax paper to help press and spread the cookie dough evenly across the entire pan. Remove from oven and immediately sprinkle the melting chocolate pieces over the hot dough. Allow the chocolate to melt (about 10-15 minutes), then spread the melted chocolate evenly over the cookie dough surface. Add sprinkles. Refrigerate the pan of cookie bark for about 15 minutes, until the chocolate firms. Remove from the refrigerator. Using overhanging parchment/foil as handles, lift the cookie bark out of the pan and onto a cutting board. Store cookie bark at room temperature in an airtight container, with wax paper between layers for up to 10 days. 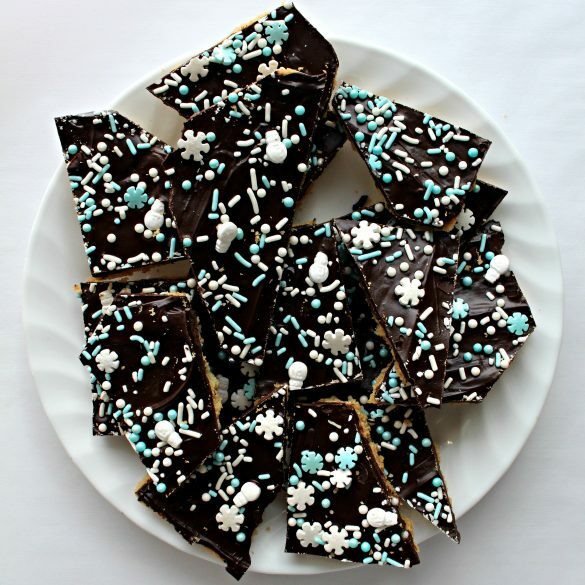 Layer cookie bark between sheets of wax paper in an airtight container or tin. Use crumpled wax paper at the top of the storage container to ensure no movement during shipping. Only mail cookie bark in cool weather. I was not compensated for this post, however I did receive free product from Chocoley.com for use in this recipe. All opinions are 100% my own. I only use and recommend products I believe in. This is such a great idea. Simple but very beautiful. I love those little snowflake sprinkles. Very festive. I haven’t been by for awhile! Big mistake because I’d make this for Christmas in a heartbeat! Lovely photos, too! Happy New Years! Happy New Year, Wendy! Hope the year is full of happiness, good health, and discovery for you! Love this idea of a sugar cookie bark!! What a tasty idea and they look just perfect for this serious winter we’re having right now. How nice to make this and share with others to perk up their day.